I don’t make my own salsa that often. It’s a fiddly job, with lots of chopping involved, and although a homemade salsa is a fine, fine thing, I often settle for the store-bought stuff. I’d rather focus my attention on making guacamole. But one of the things I love about cooking with a crowd is that it frees you up. Tonight making salsa was my only job. My mom made rice and salad and heated tortillas; my brother made a tasty pot of black beans and the guacamole, and I chopped nectarines. My mom brought a brimming box of nectarines and apricots home from the farmers market this morning (you can just do that in June when you don’t live in Seattle, apparently). They were on the small side, which my kids always love–they fit perfectly into my middle daughter’s three-year-old hand and she munched through a couple right away. My one-year-old tried to emulate her older sister and did manage to eat quite a bit of one, while also managing to smear nectarine everywhere. My five-year-old has a very (very!) loose front tooth and needs her fruit cut into slices. There’s a story in there about the passage of time told in nectarine-management. I like being on vacation with nothing to do but observe and enjoy these things. You want sweet but firm nectarines for this salsa, in my opinion. (I sometimes think a crisp peach is as good as a meltingly juicy one, though. You might disagree.) Like most recipes, this one is all about tasting and balancing the flavors as you go until the salsa is perfect for the occasion. We ate ours on black bean tacos, but it could equally well stand as a savory little salad on its own in any summer meal. 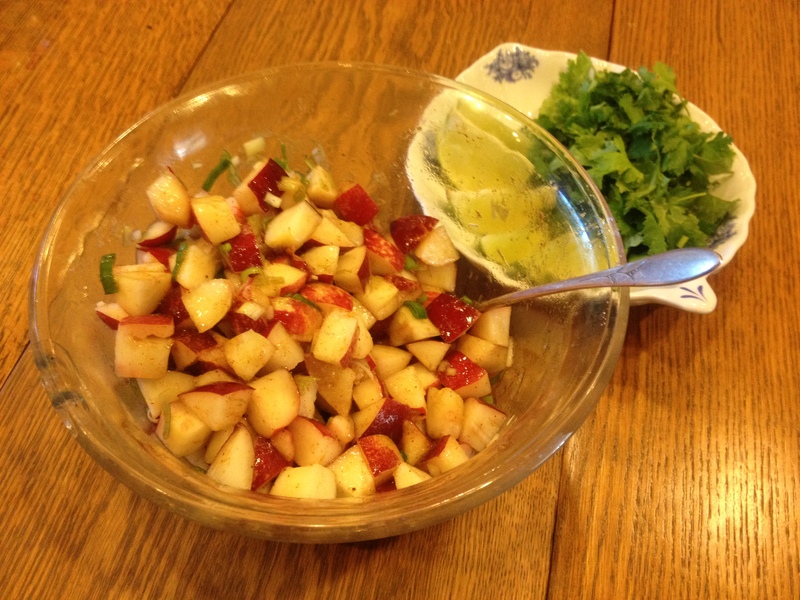 Easy Nectarine Salsa: Dice a few nectarines. Zest a lime over the nectarines and then squeeze in the juice. Add a minced green onion or two (or a few Tbsp. minced red or white onion). Sprinkle liberally with chili powder and salt. Taste and adjust the seasonings. Some additional options: If I had had a jalapeno or serrano pepper I would have added that too, but I didn’t. (Cook with what you have, remember?) We served our cilantro separately, but you could certainly add that straight to the salsa as well. And finally, consider adding a spoonful of sugar if your nectarines are not very sweet. This entry was posted in Emmy Cooks Original, Food, Fruit, Mexican Flavors, Salads and tagged bbq, feeding a family, fruit salsa, salsa recipe, serve with tacos, summer on June 26, 2012 by emmycooks. You are so right about cooking with a crowd, and how you have time to see things differently on vacation. My turn next week! 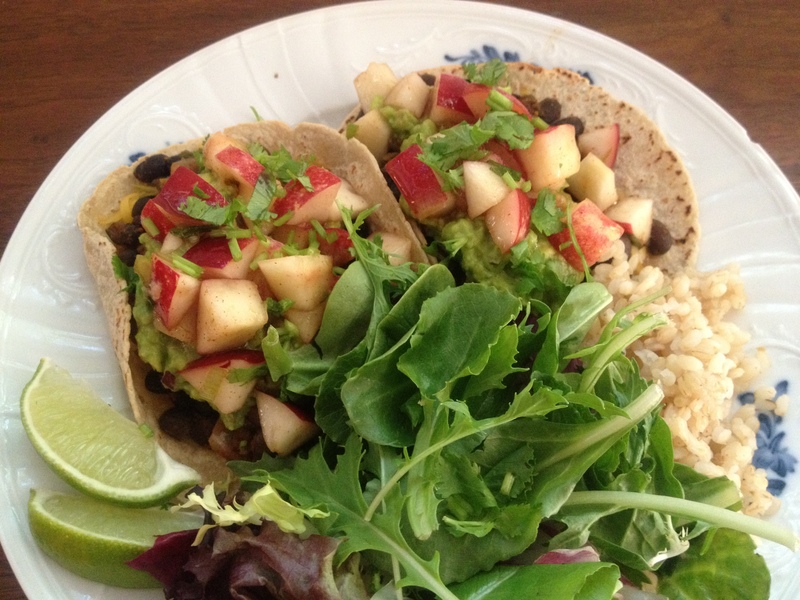 Emmy this is too weird…my dinner last night was soft tacos with avocado smothered in white nectarine salsa (I make it fairly often in summer)! Last night all I added was lime, salt, red onion, and a handful of cilantro. It was great! I often use suagar but the fruit was so perfectly sweet last night. YUM! Too awesome that you posted this! My mouth is watering from the recipe and the photo you shared. Plus, you have given me a fantastic new word: fiddly. I will be fiddling with this word as often as possible. Sounds so fresh and delicious! Fruit salsas are so tasty and versatile. I’m with you. Salsa is in the same camp as baguettes to me…and lobster bisque. Why make it when you can almost always buy something that is better and way less work..and maybe less money! That looks divine. I have always loved peaches or nectarines with some heat. I was just thinking about jalapeno or serrano chilis chopped when I saw your note. Read my mind! But I’m all about working with what you’ve got too! I have a terrible fruit salsa fettish and make it almost once a week! The looks so yummy and I just so happen to have lots of fresh nectarines in my fruit bowl. :) Happy Summer Emmy! Sounds great! I’ve made mango salsa but never with nectarines. I like your addition of scallions, too.